Sorry! The Disney Edition - There's also a Pint Size Game of this version of Sorry!. Other Disney versions of Sorry! ; Disney Moana Edition, Star Wars Edition, and Disney's Splash Mountain Theme Park Edition. Disney Pictionary DVD Game - If you don't want to do the DVD version, there's Disney Pictionary Game. Disney Junior Matching - I purchased this in Target's Spot's Playground. There are several different Disney themes that you can get to have fun matching with the kids. Finding Dory Dominoes - If you like dominoes, there's Frozen, Disney Princess, Cars, Minnie Mouse, Marvel Avengers, and Double 6 Dominoes. Disney UNO - There's also Finding Dory, Frozen, Cinderella, Sofia the First, and Pixar. Disney playing cards - There's also Friends & Villains, Cars, Star Wars, Disney Princess, Zootopia, Disney Junior Mickey Mouse Clubhouse, Frozen, and Walt Disney World parks. Some of these games we either own in non-Disney version or they just look like a fun game that might be purchased in the future. Apples to Apples Disney Edition - I've never played this game, but has been on my list of games to get. This version actually sounds rather fun. Family Feud Disney Edition - I used to love watching Family Feud on TV so I bet this is fun to play for all the Disney loving families. Eye Found It! - I have actually been eyeing this game up for awhile now. I think it would be so much fun to play. Disney Hedbanz - Another fun looking game to play with the whole family. Beat the Parents Disney Edition - Yet another fun looking family game that I'm going to need to add to our list. Candyland The Disney Park Edition - I still have the original one that I had when I was little and Michael loves playing it, but I think I might just add this to our list. There's also a Disney Princess Edition and a Minnie Mouse edition. Operation Frozen - Looks like so much fun. There's also: Doc McStuffins, Jake and the Neverland Pirates, Cars, and Finding Dory. Cranium Disney Family Edition - Another fun family game. Wonderful World of Disney Trivia - A game that has been on my list for a very long time. Monopoly The Disney Park Edition - We have the original, an I Love Lucy, a Lord of the Rings, and Monopoly Junior versions. I think we might need one more! There's also: Disney Princess, The Nightmare Before Christmas, Disney Villains, Pixar, Cars, Pirates of the Caribbean, Mickey Mouse, and Brave. Like regular Monopoly, Monopoly Junior has several Disney versions: Cars 3, Frozen, Finding Dory, Disney Princesses, Toy Story, Sophia the First, and Disney Channel. Cars 3 Trouble - Another fun game from my childhood. There's also a Frozen, Jake and the Neverland Pirates, Doc McStuffins, Sofia the First, Star Wars, Minnie Mouse, Disney Theme Park Stitch, and Pixar. Disney Junior Scrabble - I think this would be great to help encourage spelling. Might have to get this as well. There's also a Scrabble Junior Disney Edition, Frozen, and Pirates of the Caribbean. 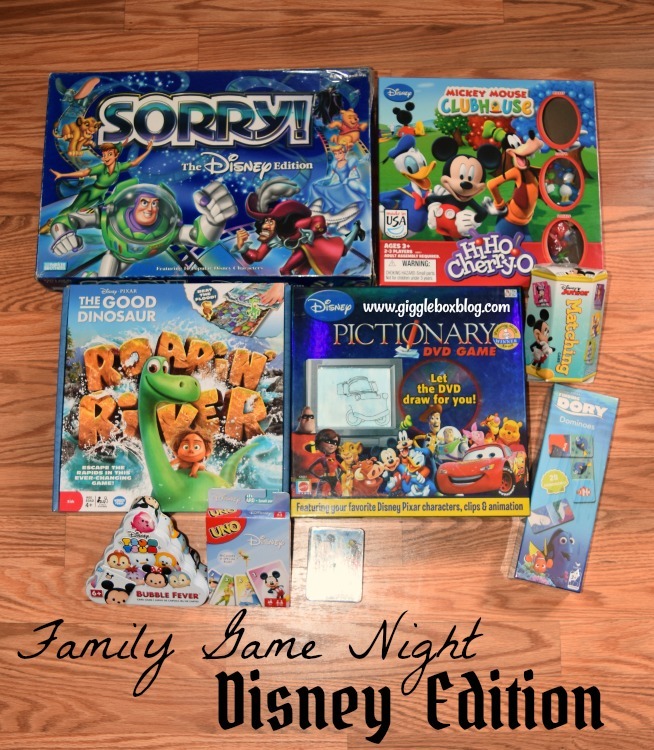 That's just a few games that the whole family will love to play for your next Disney themed family game night. I'm sure there are so much more games out there and it seems like every time I look, there's even more to have come out. What are some of your family's favorite Disney games to play?